No matter how big your kitchen is, it is very likely that at one time or another you have wished for more space. Unfortunately, remodeling your kitchen is no easy task. Kitchens are one of the most expensive rooms in a house to remodel. A few creative storage solutions can give you the space you need without having to break the bank with a remodel. Today, Affordable Family Storage discusses some potential storage solutions for your pantry and kitchen that will help you stay organized, use your space more efficiently, and create more space in your kitchen. When space is at a premium, it is important to make the most of the space you have. One storage solution that is easy to implement is to install roll-out shelves in your pantry. While it is true that the shelves will still be the same size, by using a roll-out you can more easily access the entire shelf and more efficiently pack your shelves with spices and baking ingredients. With a roll-out shelf, you won’t struggle to find that paprika at the back of your pantry that you only use for potato salad and deviled eggs. 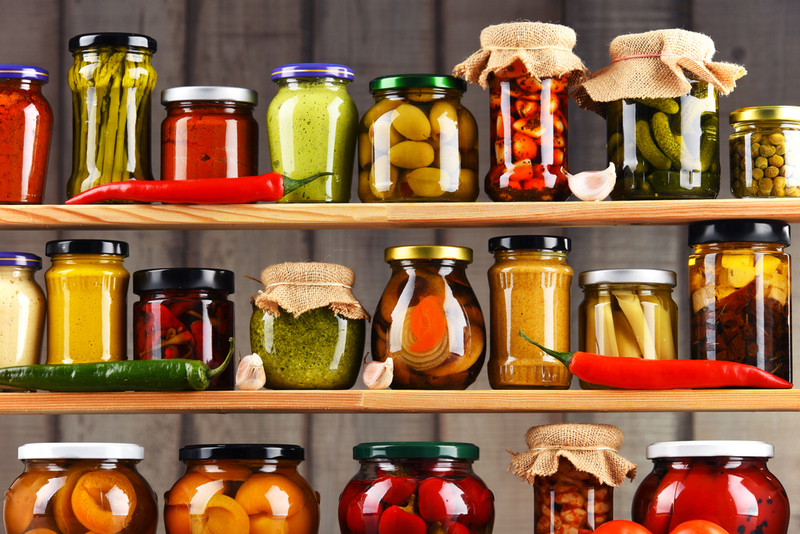 Tall, airtight glass containers are a fantastic storage solution for nearly any ingredient. Whether you are storing cereals, grains, pasta, nuts or nearly any other dry good, these containers are perfect. Whether you use mason jars, sealing canisters, or even repurposed water bottles, these glass containers will allow you to preserve your ingredients while being able to see how much of a particular item you have left. In addition, these glass containers are attractive enough to be placed on your counter, freeing up storage space in your pantry. Installing pre-built closet racks in your kitchen cabinets can be an excellent storage solution for any kitchen. In many cabinets, shelves are spaced out far too wide for things like cans or jars. Instead, replace shelves with closet racks to create a more compact and efficient storage solution for your kitchen. If you shop in bulk, an excellent storage solution is to place excess dry goods in sealed containers. Then place those sealed containers in a climate-controlled storage unit. You can be sure that your dry goods will be safe as a climate-controlled facility regulates both the temperature and the humidity levels. Keeping your excess dry goods in a storage unit can be a huge space saver for your kitchen. It also allows you to implement other DIY space savers in places like the lower part of your pantry where you used to keep bulk goods. If need some extra storage space, Affordable Family Storage is the facility for you. Stop by and check out our state-of-the-art facility at 3400 E 33rd St in Des Moines. Or if you have questions, please call us today at 515-325-0248.